Update 1.81 "The Valkyries" (changelog) was introduced on 19 September 2018. It is most notable for adding helicopter vehicles into the game. Audio for the new vehicle class, helicopters, has been created. Each helicopter has its own unique sound depending upon the type of engines and rotor blades. Cannon and machine gun sounds for helicopters have been created. Sounds for new ground vehicles have been created. Cannon sounds for the new ground vehicles have been created. The sounds of automatic ground-based weapons at long distances have been completely reworked. Now sounds which are sourced from a far distance from the player's vehicle sound more realistic. The sounds of aircraft automatic cannons and machine guns over long distances have been reworked. Now sounds which are sourced from a far distance from the player's vehicle sound more realistic. A realistic sound with automatic weapons depending on the angle of view on the vehicle has been added for ground vehicles. In ground vehicles, for automatic weaponry, the sounds echoing of shots when firing from long distance has been added. Mechanical sounds of poorly secured items has been added to the interiors of ground vehicles. New sounds of cannons for ships and boats have been created. The realism of the sound for all aircraft engines on aircraft in the air from the observer view point in the immediate vicinity of the surface of the earth or water has been increased. The audio database has been optimised. The stability and quality of the sounds in-game have been improved. New location for ground vehicle battles: American Desert. New location for aircraft battles: “Vietnam”. The roads and bridges on the following locations for aircraft battles have been fully reworked: Montmedy, Tunisia, Hürtgen, Kursk. Now the bridges will be correctly connected with the borders of the roadway and additional "embankments" have been added. Also, the bridges are now more combined with the landscape. New location for naval battles "Mediterranean port"
New location for naval battles "Green mountains gulf"
A variable rate of firing guns has been implemented. The mechanics of the “commander view” has been reworked. The camera is now tied to the turret and will rotate with it. The mechanics of slippage on slopes has been reworked. Vehicles with powerful engines will no longer be able to overcome slopes which are too steep. ST-A1/ST-A2 - Turret armour has been refined. The turret and gun mantlet have been divided into greater detail. AMX-30 DCA, Chieftain Marksman, Swingfire, Matilda Mk.II - The order of ammunition usage has been refined. Ballistics indicators for armour-piercing shells (37-152 mm) have been refined. The rates of speed drop over distance has become more accurate. A6M5 — 250 kg bomb has been added. Bf 110 G-2 — The position of the aircraft weaponry modifications in the research tree has been changed. Ju 88 A-1 / 4 — Separate bomb drop for 250-500 kg bombs have been added (source). Ki-32 — The amount of ammunition has been fixed (source). F-84G-26-RE (France) — Take-off has been fixed (source) The aircraft will respawn now in the air and not on the airfield. Z.1007 bis (all modifications) — Suspended armament setups have been changed. Bf 109 Z — Information about the weaponry in the X-Ray view has been fixed (source). Wellington (all modifications) — The display of the weaponry and modules in the X-Ray view has been fixed (source). F8F (all modifications) — Armour has been added to the front part of the fuselage. F4U-7 — The angle of the mounted rocket rack positions have been changed. LaGG-3 (all modifications), I-301 — Aerodynamic characteristics of wing, fuselage and tail corrected, polars have been tuned. The masses of various parts of the aircraft have been refined. The amount of fuel and weapon load now affect the centre of gravity more correctly. Landing-gear shock absorber stiffness has been tuned. Propulsion system performance has been recalculated and reworked - polar of the propeller has been completely rebuilt. Me 410 (all modifications) — The masses of various parts of the aircraft and propulsion system have been refined. The work of the chassis and mechanization of the wing has been refined. Aerodynamic characteristics of wing fuselage and tail corrected, polars have been tuned. Stability in high speeds in a dive has been improved (including with an air brake). Controllability in mouse-aim mode for Arcade Battles has been improved. Wyvern S.4 — Engine model has been updated. Start and stop have been made more realistic. The work of the constant speed controller has been adjusted. Ki-44-II (all modifications) - a bug that caused engine overheat at idle speed with closed radiator shutters at any speed has been fixed. Fuel consumption at WEP has been reduced and has been updated. I-225 - tuned according to the data sheet. X-ray view and damage model bugs have been fixed for many vessels: spaces between armour and cover have been fixed, missing hatches and armour plates have been added, missing modules (engines, fuel tanks) have been added to the x-ray view, heavy ships’ hull turret aperture external view has been corrected, and armament info cards have been fixed. The maximum vessel speed displayed in the info card has been fixed for the LCS(L)(3) and KMS Emden. Armour thickness and arrangement has been fixed for the “Krasny Kavkaz” light cruiser, “Fletcher” (DD-445) destroyer, as well as for the AF D1 and AF D3, MBK pr.186, Raumbots R-130 and R-301 (armoured conning towers have been added). R-41 Raumbot’s 37мм SK C/30 gun has been replaced with the MG C30 20 mm autocannon. BM-14-17 launcher has been added for the Pr. 1204 late as a researchable modification. Type Pr. 159 spawning has been corrected, previously it spawned in boat spawning zones. The initial position of the camera on project 123k and 123bis, od-200 and BMO has been corrected. Issues with the destroyed model of the Cruiser Krasny Kavkaz, destroyer Frunze, the Higgins 81ft and the pt-6 have been fixed. The number of stars on the U.S. flag now varies depending on the vessel’s year of service. The Higgins 81ft and pt-6 bug where a torpedo could be launched even with a damaged torpedo launcher has been fixed. Leakages from breaches below the waterline are now more significant: depending on the breach size and vessel speed, the vessel will now accumulate water inside more actively, gaining respective heeling or hull angle. Modules placed in flooded sections (engines ammo storages, transmission etc.) receive damage and may become completely disabled. Ammo in flooded storages becomes unavailable. You may repair modules and make the ammo available again by repairing the breaches and pumping the water out. Breach repair and water pumping time has been updated. The time required for a vessel with unupgraded pumps and crew to pump the water out and repair the breaches should not exceed one minute on average, however larger breaches, and pumping the water out of larger sections of destroyers and cruisers, may take longer. The ability to fire aiming shots with only a single main calibre gun has been added. You will need to set an “aiming shot” key in the vessel control settings. Then, when you activate the respective key, only one main calibre gun will fire. FX display bug has been fixed. A second winter camouflage for Japanese and French ground vehicles has been added. Late summer camouflage for top Soviet vehicles has been added. Two types of desert camouflages for late German vehicles have been added. “CENZUB" camouflage for AMX-30B2 and AMX-30B2 BRENUS has been added. City camouflage for the Chieftain Marksman has been added. PGH-2 “Tucumcari” (US) — BR reduced to 3.3. S-100 (1945) (Ger) — BR reduced to 2.3. SF40 Leichte & Schwere (Ger) moved to rank 2. BR has been increased to 2.7. Type 140/141 Jaguar (Ger) — BR reduced to 3.3. MZ-1 (Ger)— BR has been raised to 3.7. Pr.1124 (1940) (USSR) — BR reduced to 2.0. It will now be possible to save your decorations and decals preset in the customization section for tanks for specific camouflages by creating your own unique preset for each aircraft or ground vehicle. Now by switching from one camouflage to another attached decals and decorations will be restored in their placement points. All shells or additional (external) armament modules are available in the test drive for not yet purchased premium vehicles. In RB ground battles, the cost of respawning ground vehicles has been reduced by half, and for reserve vehicles, has been removed altogether. The accrual of respawn scores has been reduced for all actions in RB ground battles by ~30%. 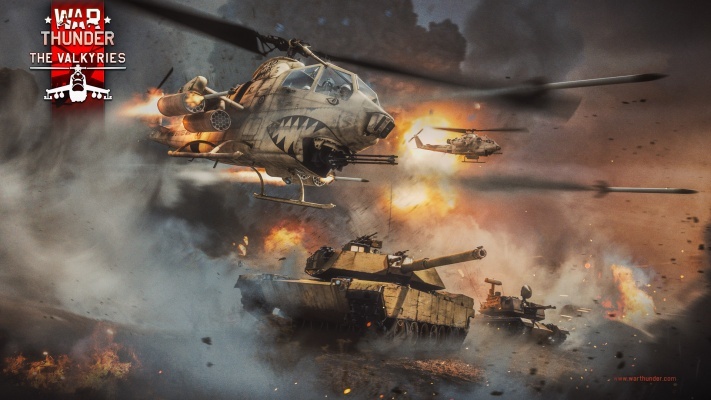 New helicopter air battles that can replace aircraft with a 50% possibility in each Arcade Battle for ground vehicle game sessions have been added to games rated at BR 9.0 or higher. For 3 destroyed enemies - a helicopter with ATGMs will be available (instead of a bomber). For 2 destroyed enemies - a helicopter with unguided aircraft rockets (instead of an attacker). For 1 destroyed enemy - machine gun and/or cannon armed support helicopter without any rockets (instead of a fighter). The setting “Change the rate of fire” for cannons has been added. Possibility to zoom in in the tactical map view by using the right stick has been added. Multiple bugs in the operation of squads between the PS4 players have been fixed. Synchronisation of the squad status with PS4 system interface has been improved. A bug causing infinite loading of the friend list has been fixed. T-Flight Hotas 4 and T-Flight Rudder Pedals support has been improved. Support of the Thrustmaster T.Flight Hotas One joystick has been added. The option to purchase Gaijin Coins through Steam Wallet has been added. Please note: purchase costs in this case will be higher than through Gaijin Store. Since we're paying revenue share to skin makers in real money, we have to make sure they get an equal amount regardless of purchase method of Gaijin Coins. So unfortunately we have to include payment systems fee (if it's bigger than 2%) into the price of Gaijn Coins. Models of the German and Soviet pilots have been updated. A bug with displaying of the helicopter research tree when no CBT access is available has been fixed. A bug where in test flight, the sighting settings has not been applied has been fixed. A bug where from pilot view (from the cockpit) in the Spitfire the camera was shaking has been fixed. In SB mode for helicopters, the hover mode has been switched off. Button “H” is now for switching the stabilization modes, which are individual for each helicopter. A bug where some players there was no display of trees and bushes beyond 20 meters distance has been fixed. A bug where battle statistics did not show the statistics of a player that had joined a battle in progress has been fixed. A bug where lower and right edges of the screen disappeared at lower screen resolutions has been fixed. A bug where the Ru 251 did not launch all of its smoke grenades has been fixed. Fire continuing to burn after a destroyed vehicle had disappeared has been fixed. A missing fence animation bug has been fixed. Naval vessel and helicopter controls (as well as control tips and help) are now available for all players. Reduction of 40,000 on adding your first helicopter into a crew slot. The “Missile-Launching Magic Carpet” achievement which incorrectly gave 500,000 SL for purchasing your first helicopter now gives 5,000 SL. A bug on Linux which would occur when placing the mouse cursor to the edge of the screen, whereby it would then move to the upper left corner by itself, has been fixed (source). A bug which would cause automatic login to fail after switching from the in-game browser to an external one has been fixed. Helicopter respawn costs have been reduced by 20%. After installing an ATGM on a helicopter, the respawn cost will be increased by 40% of the base respawn cost. Respawn costs on all aircraft have been increased: for fighters by 50%, attackers by 30%, and bombers by 20%. The variance of costs for available additional vehicle weaponry (such as cannon pods, bombs, etc) on fighters has been removed. Su-6 AM-42 - aircraft in-game info card updated according to current data. LaGG-3 (all modifications) - a bug with water radiator auto control has been fixed. All Helicopters: Ring vortex effect has been increased. AH-1G/F, Mi-4: Automatic stabilization (SAS mode) toggle order has been changed. Core engine momentum has been increased. New decals with “eyes” images have been added to the “Nose art” group. The mechanism for playing firing sounds with automatic weapons on ground vehicles has been optimized. Changes in the sound of automatic cannons for ground vehicles at medium ranges (approximately 250 to 500m) have been made. The mechanism for playing firing sounds of automatic weapons for naval forces has been optimized. The mechanism for playing firing sounds for aircraft cannons from cockpit view from aircraft and helicopters has been reworked. The loudness of the external sounds of the surroundings from the cockpit view in aircraft has been heavily reduced. The mechanism for reproducing the sounds of causing damage to a player's aircraft from the cockpit and 3rd person view has been improved. Sound resources in the game have been optimized in order to save memory. A bug where when restarting an engine on aircraft, excessive torque was created has been fixed (source). M8 Scott - Material of the front turret armour has been changed from rolled homogeneous armour to cast homogeneous armour. Leopard 1 - A bug where reloading whilst on a captured point, 12 smoke grenades, instead of 8 were added has been fixed. Leopard A1A1 - A bug where some of the cast turret parts were made from rolled homogeneous armour has been fixed. 105 mm T182E1 (T54E1) - The armour-piercing shell type has been changed from APCBC to APBC. Source: AD390746 Aberdeen Proving Ground report. // THE EFFECT OF SYSTEM DESIGN CHARACTERISTICS ﻿ON FIRST ROUND HITTING PROBABILITY OF TANK FIRED PROJECTILES﻿ (U). AEC Mk.II - The angle of gun elevation has been changed from -12/+20 to -10/+20. Source: T.D.9553, Armoured Car A.E.C. MKII. A.F.V.W. 34., The Tank Museum Plans Packs: A.E.C. ARMOURED CAR Mk.II. 15 cm Pz.W.42 (Previously Panzerwerfer 42) - Short and long designation has been refined. The order of ammunition consumption has been corrected. Tiger II (P) - The modification “Smoke grenade” has been added. M4 748(a) // Tetrarch Mk.I // Crusader Mk.III - A bug where it was impossible to reload smoke grenades on a captured point has been fixed. A30 Challenger - The traverse speed of the turret has been changed from 14 to 33 degrees per second. Source: BRANCH REPORTS ELECTRICAL, Report V/EL NO. 30. A.30 TRAVERSE GEAR PILOT B. General performance and reliability trials, The ﻿National Archives WO 194/170 // P.M. Knight, A30 Challenger Tank A Technical History, Black Prince Publications. FV4005 - Designation of the cannon has been changed from L4 to L4A1. The weight of the explosive mass in the armour-piercing HE shell has been changed from 12.7 to 17 kg. The type of the explosive mass for this shell has been changed from RDX/TNT to RDX/PWX. Source: Firing trials against Conqueror tanks with additional ballistic protection. Part 1. The use of large squash-head rounds. FVRDE, 1956. Pz.Bfw.VI (P) - The order of ammunition consumption has been corrected. T-55AM-1 - RPM for maximum power of 690 horsepower has been changed from 2200 to 2000. Source: Танк Т-55АМ - Дополнение к техническому описанию и инструкции по эксплуатации танка Т-55. 3-inch HE (Churchill Mk.I) - The weight of the shell has been changed from 6.3 to 6.02 kg. The weight of the explosive mass has been changed from 530 to 606 grams. Source: Allied Ammunition Bulletin No.26, Chief Inspector of Armaments, Royal Arsenal Woolwich. Churchill Mk.3 // Churchill Mk.I / Pz.Kpfw.Churchill // AEC Mk.II // Cromwell Mk.I // Crusader Mk.III - Limited vertical stabilization on the gun via a crew shoulder rest has been added. Type 94 - The engine power has been changed from 70 hp. (2000 rpm) to 68 hp. (2800 rpm). Number of gears has been changed from 5 to 4. Source: 陸軍技術本部, 昭和十二年四月 「九四式六輪自動貨車仮制式制定ノ件/ ﻿﻿ Army Technology Headquarters (April 1937) "Temporary adopt formula of Type 94, 6-wheeled truck" // JACAR Ref.C01004346800 "Army Technology Headquarters research policy change and temporary adopt formula of Type 95 field gun and another". AMX-40 - Engine power has been changed from 1100 to 1300 horsepower. Source: Les Chars De Combat En Action, Tome 4, RAIDS n﻿°29. Centurion Mk.3 // Strv 81 (Rb.52) - The number of shots for the first order ammo-racks has been changed from 11 to 8. Source: de la Riviere, D. (1951). A motion study of the ammunition stowage of Centurion 3. Chieftain Marksman - Number of respawns in Simulator Battles has been changed from 1 to 2. AMX-30 - Armour index for the cheeks of the turret has been changed from 20 to 41.5 mm. Sherman II // A33 Exсelsior - The 89 Smoke shell has been added. Source: Canadian Archives Microfilms, DEPARTMENT OF NATIONAL DEFENCE -ARMY- BRITISH A.F.V. SPECIFICATIONS. M1 Abrams // M1 IP - The Indicators of multiplicity on the sight have been refined. Initial multiplicity 3х has been added to the already available 10х. Source: IN﻿TRODUCTION TO THE M1 ABRAMS TANK : ARMAMENT SUBCOURSE NO. OD0468, US ARMY CORRESPONDENCE COURSE PROGRAM. Jagdpanzer IV - The elevation angles have been changed from -5/+15 to -8/+15. The traverse angles have been changed from -20/+20 to -12/+12. Source: Documentation W127 // Panzer Tracts No.9 - Jagdpanzer - Jagdpanzer 38 to Jagdtiger. 57mm Type 92 APHE - The designation has been changed. Previously Type 90 APHE. Source: A03032062400, Ground Battle Reference #1, Ground weapons Outline, Navy Artillery School Research Department, Japan Center for Asian Historical Records, National Archives of Japan. A bug where there was no collision between some mountains in the location “Italy” with helicopters has been fixed (source). A bug where bombers were able to continue to fly after the tail of the aircraft was torn off has been fixed (source). I-225 - focus shift with flaps fully extended has been recalculated. Landing with minimal fuel will now be easier. Hs 123A-1 - the engine modes have been updated. Thermodynamics, engine start and stop time, and landing gear shock absorber elasticity have been updated. Та 152 (all modifications) - Propulsion system (prop & engine) inertia, as well as its start and stop timings, have been tuned. Rudder deflection simulation is now more accurate (deflection at high speed is now smoother). G.50 (all modifications) - Rudder deflection simulation is now more accurate, engine start and stop times have been updated, and elevator surfaces and their deflection at different speeds have been redefined. C.200 (all modifications) - inertia of the propulsion system (prop & engine) has been updated. Rudder deflection simulation is now more accurate, engine start and stop times have been updated, and elevator surfaces and their deflection at different speeds have been redefined. C.202 (all modifications) - inertia of the propulsion system (prop & engine) has been updated. Rudder deflection simulation is now more accurate, engine start and stop times have been updated, and and elevator surfaces and their deflection at different speeds have been redefined. C.205 (all modifications) - inertia of the propulsion system (prop & engine) has been updated. Rudder deflection simulation is now more accurate, engine start and stop times have been updated, and and elevator surfaces and their deflection at different speeds have been redefined. F4U-4, 4B - inertia of the propulsion system (prop & engine) has been updated, rudder deflection simulation is now more accurate. F4U-4B - Speed has been increased by 16 km/h as the outboard wing weapon mounts have been removed. Gladiator (all modifications) - The engine’s RPM when the throttle set to 100% has been changed to 2,650 instead of 2,400. The flight model’s propeller width has been increased. The ‘combat’ position for flaps has been removed. Propeller spin up speed has been tuned. Rudder performance has been updated. The tail fin angle has been changed to compensate propeller momentum in cruise mode. S.M.79 Sparviero (all modifications) - Aerodynamic characteristics of the wings, fuselage and tail have been corrected and the fin and flight polars have been tuned. The propulsion system performance has been reworked. The influence that the weight of different aircraft components have on the behaviour of the aircraft has been recalculated. Fueling and combat loading will now more accurately affect the mass centre alignment. Thermodynamics has been updated. Cooling efficiency at flight speeds has been implemented. A bug related to the working mechanics of the referral system has been fixed. A bug occurring when dropping an aircraft’s last bomb, where the bomb sight would become displaced, has been fixed. A bug, where other players could hear sound emanating from helicopters which had their engines off, has been fixed. (source). A bug resulting in an incorrect switch of camera view for the Mi-24A helicopter following the message “Gunner: target in the dead zone” has been fixed. Laptop AMD discrete GPU crash has been fixed. Economy changes for repair price costs and multipliers of vehicle awards. The reward will depend on the time spent in a game session - the longer you play, the higher the reward will be. The reward is not limited. Activity of a player will be calculated relative to the time that they have spent in the game and not based on the total session time which will lead to an increase in activity and accordingly, rewards for players who cannot finish the session to the end. The new system will not affect the rewards for actions in battle. In all variants of aircraft Simulator Battles, a new system of RP reward calculation for victory and defeat has been switched on. The higher than other game modes average earnings of RP in this mode will be increased by 30%. In the battle result tab the display of the “bonus to event reward” has been deleted and the rewards for actions in a battle have been reduced by 20%.